Bro. Thomas Walter Urbanek was installed as the Junior Steward of Phoenix Lodge No. 8 A.F.& A.M. on 3 January 2015. Bro. Thomas Urbanek was also named Phoenix Lodge Mason of the Year for 2014. 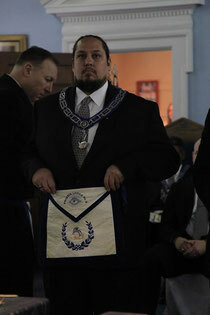 Brother Urbanek is also a 32° the Scottish Rite Mason of the Valley of Raleigh A.& A.S.R. S.J. Brother Urbanek is extremely active in Masonic Youth Activities with his children. He is active in our NC Masonic Home for Children Committee. He is also every aspect of our lodge day-to-day operations, our facilities maintenance and restoration committees, and our ritual committee.